Dan saying that the night before the vote Ashley was saying she was voting to save Kara. Dan asks him if Boogie would of done anything differently these last couple days. Boogie says no. Basically talking about Willie being a sinking ship and Shane should think about jumping ship to keep himself safe. Britney tells him that Willie has royally messed all their games up. She tries to talk to him and get him to keep his move shut but nothing seem to work. Joe pokes his head in the room.. they ask him for some time. Here we are folks the First Live Eviction and the Second HOH for Big Brother 14. It’s been probably one of most crazy first weeks I can remember on the Feeds. If the feeds are like this all summer this season will go down in History. How the swing vote is going to go is anyone guess but the other votes are pretty set in stone. Britney says she didn’t announce changing her name but the psychos figured it out. 1:10pm Janelle and Britney are talking in the HOH bathroom. Britney says that she is a little worried about next week but that she can only lose one team member. She says that she is trying to keep a positive attitude about it. Britney tells Janelle that Willie is really emotional and that she tried to tell him to calm down. She says that he goes crazy the moment he hears someone saying something about him. Janelle agrees. Janelle says that she doesn’t think any of the coaches have control over their players. Boogie comes into the bathroom to pee. Britney and Janelle tell him that he is the third person they have listened to pee. Britney jokes that the next competition will be determining each other by how they pee. Boogie stays in the bathroom after and they discuss how the have-nots will be picked. Britney asks if the coaches are still in a no slop alliance. Boogie asks what if we were included in being picked as have-nots. Britney says yeah. Boogie says oh yeah. Big Brother keeps cutting the feeds in and out. 10:45am Willie, Kara, and Jojo are in the storage room talking. Kara tells them that Ashley said this morning that she doesn’t know who she is voting for, when just last night she told me I have her vote. Jojo says that she is going start going crazy and start throwing sh*t. Willie asks Kara if Ashley told her she was safe yesterday. Kara says yeah and then now this morning she isn’t sure. Willie talks about how last night he saw Wil hugging Ashley 100 times yesterday. Willie tells her not to give up …that its her life …usually the last person to talk to someone before the vote gets the vote. 10:55am Willie confronts Ashley in the kicks room. Willie asks her if she is voting for Frank to stay. Ashley says that she doesn’t know. Ashley says that Frank told me that you said that you had me eating out of the palm of your hands. Willie says that he is going to knock someone the fu*k out in a second. They are lying. Ashley says that Willie is taking Jojo to the final two. Willie says that he isn’t, he never gave her a final two deal. Ashley says that she is mad at Willie for leaking that they were working together. 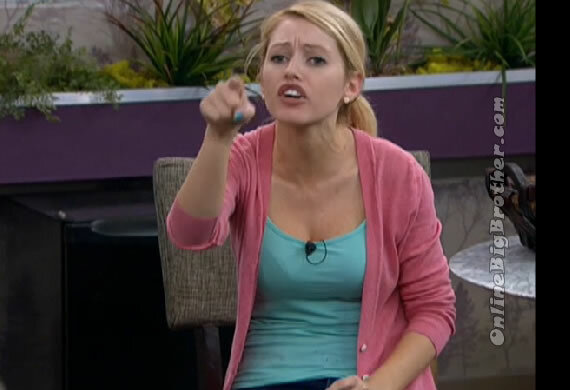 Willie tells Ashley that if you don’t vote out Frank, then this is over for you …you will not win this game. 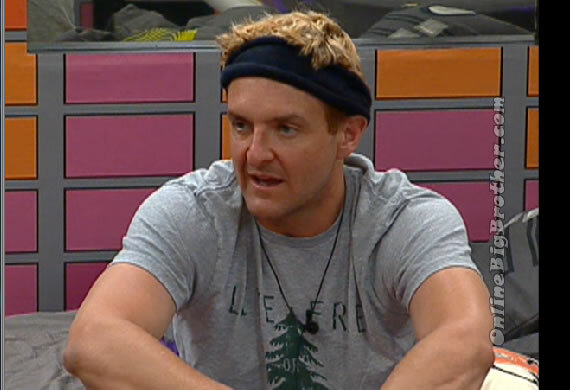 Watch what happens, AS it happens: Big Brother 14 Live Feeds! Subscribe today for your FREE 3 DAY TRIAL! Ashley wants to make sure he’s got her Back because tomorrow is a big day and she thinks she’ll be in the centre of it all. Wil joins them tells them that Kara told him that she’s going to put up Joe if she wins HOH. Ashley says that after she told JoJO and Willie that she’s done working with them they were telling her that the other side thinks she’s stupid and trying to convince her to stay with them. Ashley adds that she doesn’t want to turn her back on her team. Subscription Link 3 day trial Britney is PISSED at Willie for running his mouth off to Dan. During his conversation with Dan Willie mentioned that anyone can flip at the last moment. Britney feels like willie is giving dan little bits of information every-time he talks to Dan and it’s going to screw them in the end. 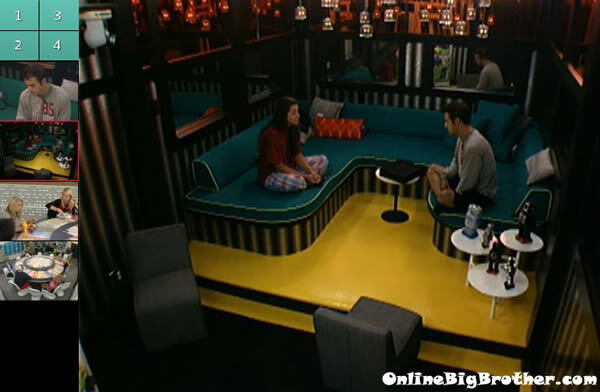 6:13pm CAm 1-2 Boogie and Janelle They are talking about Willie being able to sway Ashley over to his side. Boogie calls the other people in the house idiots, Janelle thinks the house is completely stupid. Janelle wants to know where Ian’s head is because he watches the game. Boogie: “Ian is just happy to be here.. He never talks game to me” boogie continues about how Ian would be down for going against Willie.